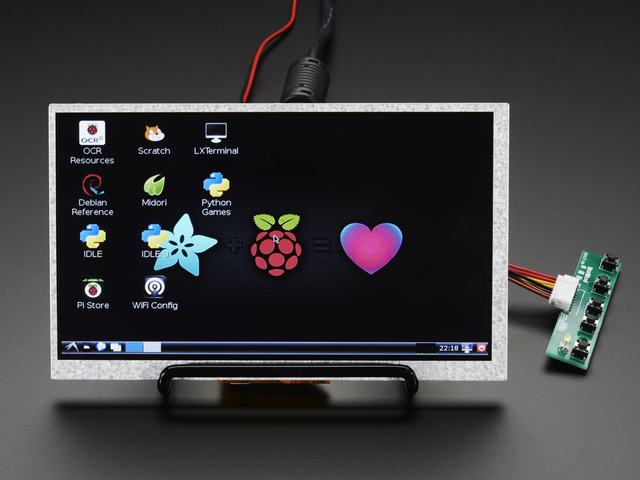 At the Adafruit store, we've added a ton of great new HDMI-compatible displays for your Raspberry Pi or anything else with HDMI/VGA/Composite video output. But, like we said, we've added a ton and so it can be a little overwhelming trying to find the perfect display for your project. Don't fret! 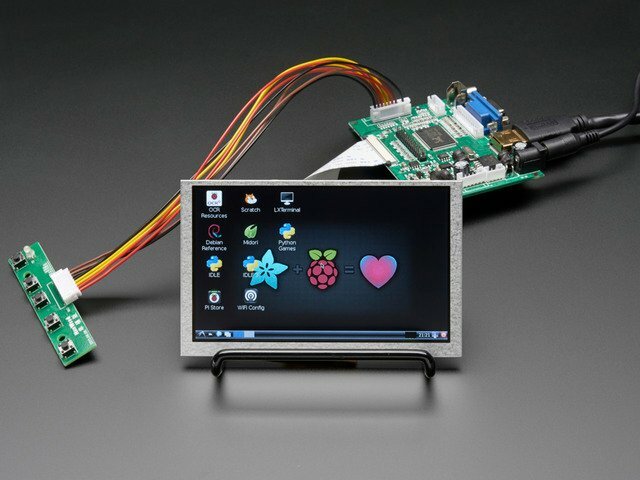 There's now an ÜBERGUIDE to Adafruit's LCDs & Displays category. You'll pay more for more inputs - a VGA/NTSC/PAL/HDMI driver costs more than just an HDMI driver. 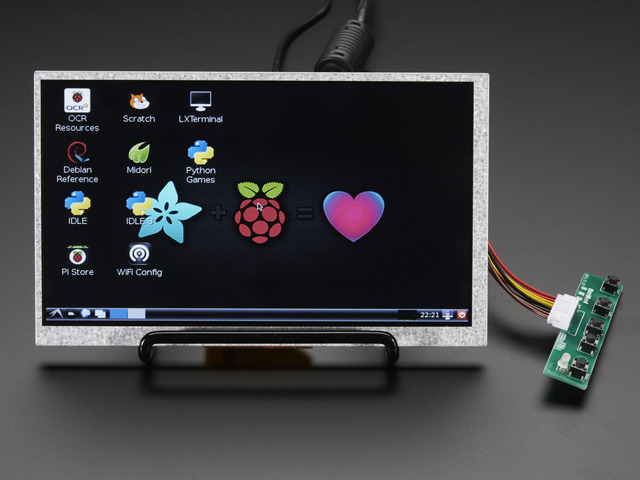 Some displays can be paired with an HDMI+Audio driver. This lets you have both video and audio over one cable, but adds a little cost. IPS (In-Plane-Switching) looks amazing, and gives the screens a great look and wide viewing angle, but adds some cost. All our screens have been tested with a Windows desktop computer (we run Win7 but it should not matter which version). You can also use these displays with a Mac and even a console like an XBox (you'll want the higher resolution displays for this, 1280x800 is best). We've tried to find a match that fits every need and budget but will keep on adding more as the demand arises. There's also an FAQ page for questions that have come up and some more info on how to set up your driver board. Do the displays have 'snow' or a lighter-image if the signal weakens? Nope! All of our displays have pure-digital input decoders. They're not suitable for FPV displays where you want the display to go fuzzy instead of cut out. If you power cycle the display does it turn back automatically or does it need to be switched on each time via the power button? All of the displays auto-turn on when power is applied. It goes to whatever was last selected so you have to set it up once then every time its power cycled it will come up automatically. How come I hear a ticking noise when I shake my display? 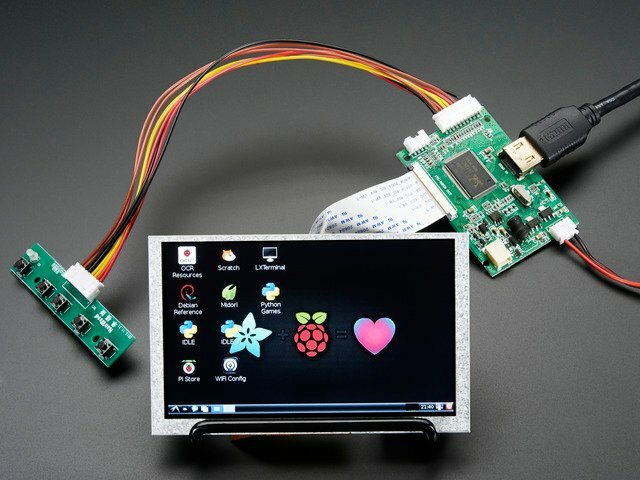 Which displays are good for use with older arcade/computing devices with 4:3 ratio? The RTD2668 based drivers (HDMI+Audio) say they have a 4:3 mode but when you try to switch it over, nothing happens to the display so we don't think it really works! What happens if I can't output the native resolution from my device? You can send a higher or lower resolution image and the HDMI driver will automatically scale it down or up. However it wont look as good because of the scaling! For the best look, especially crisp text, use the native rez! How do I set the resolution in the monitor/display? You can't! Resolution for HDMI/VGA/Composite is always set by the video emitter. If the resolution isn't right on the monitor, go to your computer/console system prefs! Eeek I set the RTD2660H-based driver into a bad mode and now I can't see anything! then press these buttons, wait about 1 second between presses! 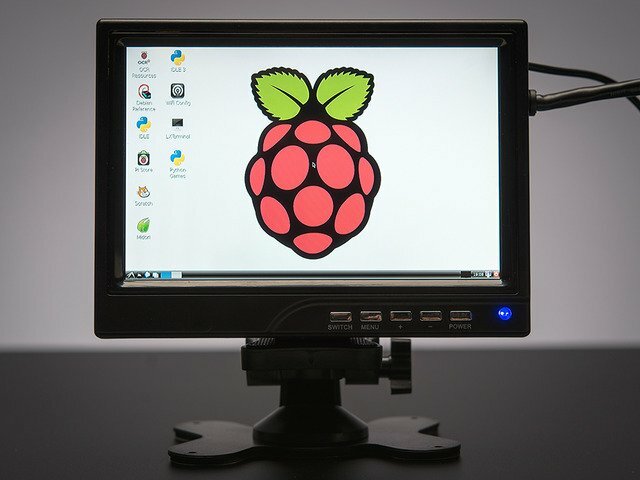 I'm getting vertical line(s) when the display is connected to a Raspberry Pi. Use raspi-config to force audio out the 3.5mm audio jack (rather than HDMI or auto). You can power it from a USB port, which is rather nice for portable setups! This is our smallest HDMI-compatible displays, works great and is very small! We also have this display with a VGA/NTSC/PAL/HDMI driver (#2110). These displays use the TFP401 HDMI decoder chip and have their very own guide! This is a medium sized, but easy to use HDMI-compatible displays, works great and is fairly small! The display looks nice and bright. We also have this display with a mini HDMI-only driver (#2300) and w/ audio (#2301). We also have this display with a mini HDMI-only driver (#2300) and standard driver board (#2299). Click here for more info on the driver board that's inside of this one! This monitor is nice when you just want a plug & play stand-alone solution. It's basically the same electronics as #1726 but in a case with built in speakers! This display is the same 7" display as in PID 1033, but with a different driver board. There's a 3.5mm audio jack input on the side, this is for VGA-usage only, so you can have video and audio. It doesn't work with NTSC! You must hit Power before unplugging or the changes will not save. We're not sure what the driver board on this one is. But it works great just the same! If you want this same display in a casing, check out #1033 or #1667. This kit is best for when you want to customize the casing. Note that there's a very thin bezel on this display so you can mounting it but must be done from the back of the display! This is one of our prettiest display It's got excellent resolution (1280x800!) and IPS display so it is bright, crisp and looks good from any angle. This driver even has HDMI audio support and can drive two 4 ohm speakers directly. This is a medium sized, but easy to use HDMI-compatible displays, works great and is fairly small! The display looks nice and bright. We also have this display with a mini HDMI-only driver (#2396) and w/ audio (#2397). This is a medium sized, but easy to use HDMI-compatible displays, works great and is fairly small! The display looks nice and bright. We also have this display with a HDMI/VGA/NTSC/PAL driver (#2395) or w/ audio (#2397). We don't have a datasheet at this time. The revolutionary Pixel Qi display is different than the other displays we carry and is the only one really designed for indoor/outdoor in full sun! The display is made with two layers, color and grayscale. Indoors, the color layer is visible. When outside, you will automatically see only the grayscale part of the display. If you want to save power you can remove the backlight connector from the driver. We carry a number of different drivers for our HDMI screens. Each has different specs, look, and inputs. We've outlined each below with a picture and datasheet as well as the power needed to drive the board. This is our most compact and least expensive driver board. It only has an HDMI input and doesn't have audio. All JST connectors are JST-XH type, 2.5mm pitch. Each driver board comes with a few menus of customizable settings. We go through each below, with some helpful pictures, to show you what you're able to easily control! The keypad buttons help you navigate the display menus and sub-menus. When you first start up, you can use the Auto/Back key to select the input source! OSD Timeout - Adjust the time for the display to go black. 4:3 - compresses image to 4:3 - does not cut off the image! Keep going down for more options! This is our 'workhorse' display driver board. It has multiple inputs and works well with both TTL and LVDS screens. It does not, however, have an audio output. The VGA, Power and A/V inputs, the white JST ports are good alternatives to the main inputs if you don't want bulky cables coming out the sides of your driver board. All the white JST connectors are JST-XH type, 2.5mm pitch. Power Input: In theory, the board datasheet says 5-24V but we found that 9-12V DC works best. There's a switching regulator so current draw will be lower when using higher voltages, and vice versa. On some of the driver boards, there is an inverting transistor package that is now placed as a resistor (and signal inverted in software). While it's not the most aesthetic solution, the design is fine and these boards are tested and work! Each driver board comes with a few menues of customizable settings. We go through each below, with some helpful pictures, to show you what you're able to easily control! You can solder 3W 4 ohm speakers directly to the amp, like this one. Or use this ready-to-go stereo speaker set, you can just plug the connector in directly! We're not 100% sure of this but it seems like the amount of sound data you can transfer is related to the set HDMI resolution. The Power, VGA and A/V JST ports are good alternatives to the main inputs if you don't want bulky cables coming out the sides of your driver board. 4:3 - we've found this doesn't effect the image on these displays so not sure what's up with that! The buttons on the bottom read switch, menu, +, -, and power. Switch allows you to change the input. Press switch then menu to cycle through the input options of AV, VGA, HDMI, and MEDIA. The + button will select the input. While we're unsure of what the board is on this display, it does have different Menu Options. We go through each below to show you what you're able to easily control. Overscan - On/Off - When on, some of the image can be cut-off and beyond the scope of the viewable screen. This guide was first published on Aug 27, 2014. It was last updated on Aug 27, 2014.